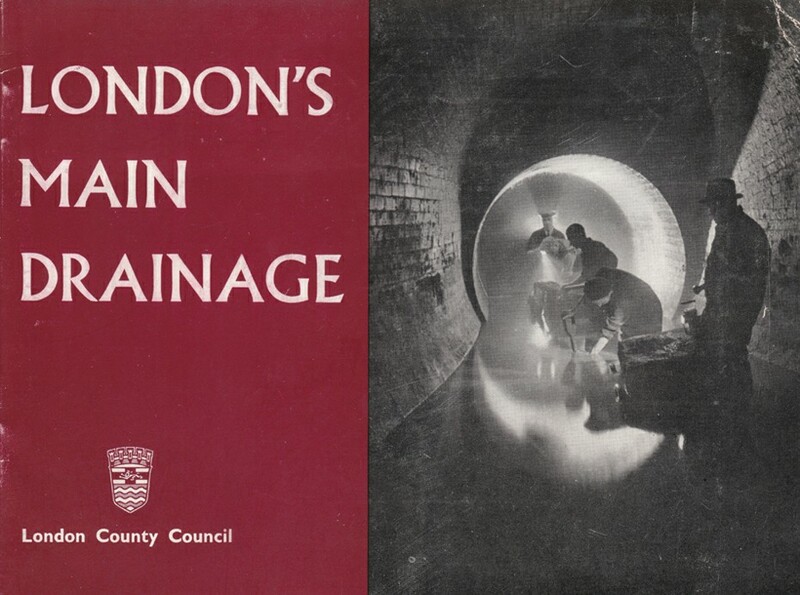 I thought I’d share some front cover images from a few variations of booklet on the theme of London’s Main Drainage, produced by a mix of London administrative bodies. I’m unsure how many incarnations of these booklets were published over the years, though I expect it is greater than the five I have. Eventually I’ll get around to scanning the actual content and putting together some pdfs for download, but for now the covers are as far as I’ve got. This being the first publication of the kind, to mark the centenary of London’s Main Drainage scheme, it is more comprehensive than its successive counterparts. 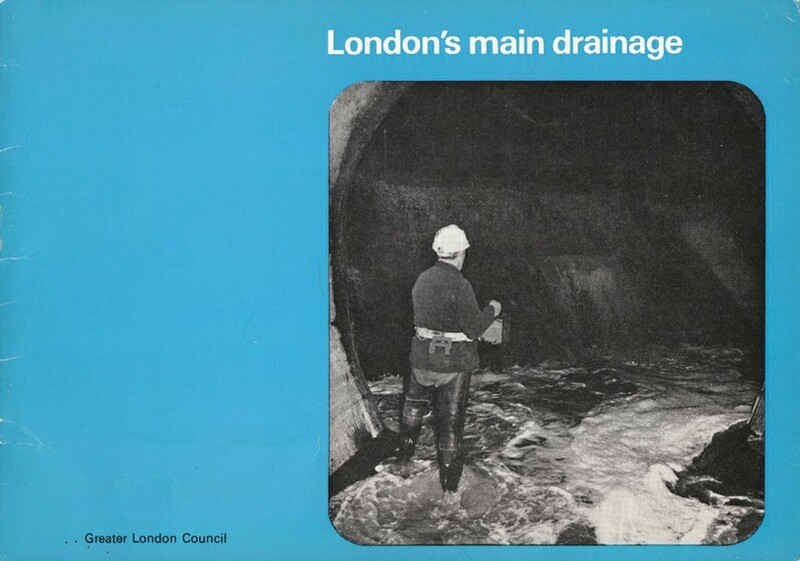 Measuring 275mm x 210mm it has only thirty pages to chart the development of London’s Main Drainage system, touching briefly on many aspects, from historical circumstances to the then current waste water treatment systems and out of county drainage. It features fourteen black and white photographs, three of which are images within the sewer network. 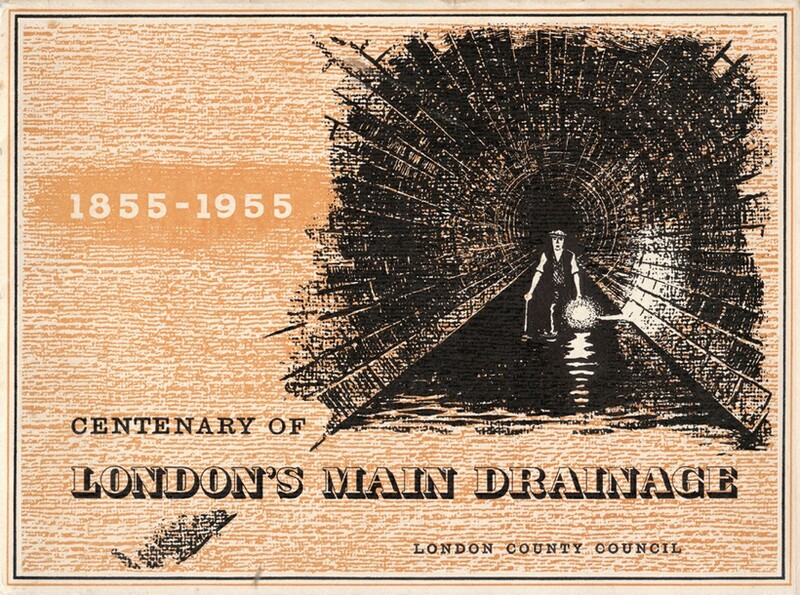 There are also four illustrations and five maps/plans, most notably a ‘four colour’ London wide map showing intercepting sewers, storm relief sewers and main line trunk sewers c.1955. Unfortunately this map is often missing as it is a loose sheet that resides in a pocket of the inside back cover. Also to be found in the back cover pocket, and often missing, is a single sheet pamphlet titled “Guide to the exhibition commemorating the centenary of London’s main drainage system“, the exhibition was held at the County Hall, Westminster Bridge 16 – 27 July 1955. The 1960 incarnation is a much reduced version of the 1955 booklet, both in physical dimensions (210mm x 150mm) and content. Across thirteen pages this booklet serves snippets and summarised texts from the 1955 centenary booklet. 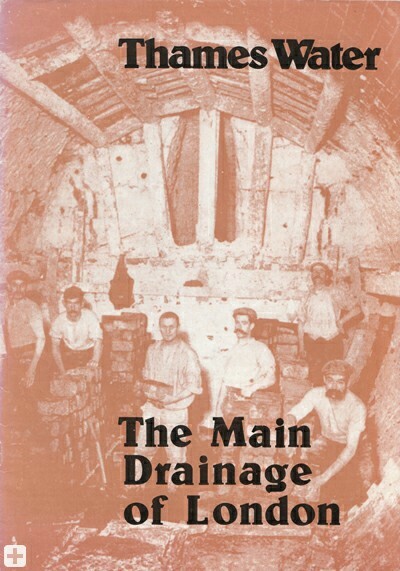 The booklet contains six black and white photographs, though only one of these is a sewer image (excluding the front cover). It also comprises one illustration and one ‘four colour’ map. The map (on the inside front cover) is a very stylised representation of London’s intercepting sewers, storm relief sewers and main trunk sewers; it is probably of more merit artistically than it might be of use as a resource. The inside back cover closes with the sentence “Applications to visit sewers cannot be entertained“, shame. In 1967 the booklet features all but the same content as the 1960 version, the text is identical but for some statistical and dating amendments. With eleven black and white photographs it is again only one image and the front cover that provides any subterranean insight. The stylised map of 1960 publication (inside front cover) has been replaced by an overview map showing the sewerage area of the Greater London Council. While this new map features pumping stations and treatment works it does not show the course of any part of London’s sewer network, other than the river Thames. On an aside, the front cover image is killer, as is that of the 1960 cover. Knowing what’s involved to get images like that on film, in less than ideal circumstances, I tip my hat to the photographer. Unfortunately there’s no attribution for the cover images, most likely due to the photographer being an in-house council employee. Between 1967 and 1971 it’s my opinion that things took a bit of a nosedive on the design front. The dimensions and content of the 1971 booklet are again a duplicate of the 1960 publication, with statistical and dating amendments. Its eleven black and white photographs (excluding cover image) feature one underground image, showing construction work on a branch sewer. The Greater London Council sewerage area map is still present in the front inside cover but is simplified in its depiction of borough boundaries. The majority of the content is dedicated to illustrating the treatment and disposal processes. The poor cover image on this booklet reinforces the quality of the 1967 cover image of the same location. The only light source appears to be a flashgun from behind the sewerman (his hand-held torch providing no useful light for such a short exposure) and consequently the foreground is lit while the chamber beyond is in all but darkness. Following the establishment of regional Water Authorities, in 1974, responsibility for London’s drainage network was transferred from the Greater London Council to the Thames Water Authority. This publication is based on a series of articles by Dr Jean Venables, published in 1973, and as a result does not regurgitate the information of previous incarnations. The booklet itself does not carry a publication date but the content suggests some time c.1975. It is comprised of twelve printed pages (including front and back covers) of an A4 format and uses two colours throughout, black and a sepia tone. Touching briefly on the early years of London’s drainage the text then charts development through the Victorian period up to the current works of the publication year. The photographs are particularly interesting, featuring twenty in total of which ten are of underground works. Also featured are four illustrations/diagrams and three very basic map depictions of the drainage network at different periods, one being the stylised map of the 1960s publication. While the content is very good in comparison to the three previous publications the presentation and production really let it down when compared to its 1955 counterpart. However, it is apparent that Thames Water did go to some effort to put together nice archival and photographic content to accompany Dr Venables’ text, and that consideration was made to avoid simply reproducing what had gone before. As it seems highly likely that this was Thames Water’s first publication of the sort I’d imagine they may have turned out at least one further previous to the onset of private interests and such information being more closely guarded and less celebrated. 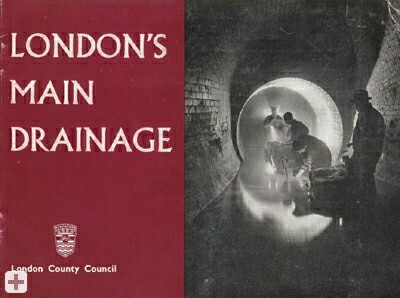 If you’re aware of any similar booklets relating to the London drainage network (ones not seen on this page) please drop me a line or post a comment. I only recently came across the Thames Water publication and have amended this post accordingly, it would be great to get my hands on any more that may be out there too. Twelve sub-urban points for the person who can name the sewers featured on the covers. A good commemorative souvenir of sewer history there. The 1955 and 1960 booklets are very nice. The last two covers look like the Charlton Storm Relief. Yeah. The 1955 one is particularly nice. The loose map that comes with it is an updated version of the 1930s one on sewerhistory.org (http://www.sewerhistory.org/images/bm/bmm3/1930_bmm315.jpg), there’s still a good few of those knocking about, they seem to go for between £20 and £35. The last two images are definitely the Charlton SR, but we all knew that, right? 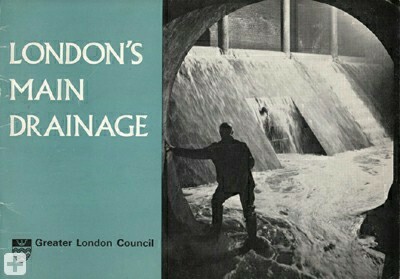 🙂 The 1960 cover image is a bit more tricky, and isn’t named in the booklet, but if I had to guess I’d say likely some part of London Bridge sewer? Wow, that was a trip. I was so shocked that sub-urban had actually been updated that i passed out for several hours, I was woken up by my dog only to pass out again when i looked at my computer. This cycle must have continued for at least five days. Im scared to read what you posted as it might happen again! Thanks. I do believe I have come across those before, but I’m sure there may be people who may not that will appreciate the link all the same. Might a reply to your comment re-initiate the cycle? I was made aware of that article after the fact, which isn’t always great as I generally like to see what exactly my pictures are accompanying ahead of publication, which in that case isn’t exactly accurate in its details. I did submit some corrections to them for their article but as far as I can see they haven’t been applied, never-mind. good to see your work recognised, and all from such a small start.